With a bit of pride we can say that Vienna now enoys our presence since November 2009. We appreciate the numerous regular customers and the ubiquitous interest, as well as the audacity to try a new concept from time to time. Furthermore, we are honored by the quite positive echo of the media. 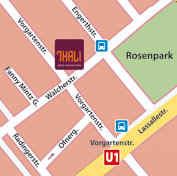 We gladly accept the benevolent placement as 'the curry house at the corner' that has always been missing in Vienna. Just try it yourself - we are opened daily for you! Menus in our restaurant reduced in price. Top quality at low prices: Fresh, first-rate food, self-made spice mixtures and preference given to regional products. Diversity and fullness of the rich in tradition indian world cuisine in a modern ambiance. Quickly available food in the self-service restaurant with open kitchen: for eat-in, take-away or order-out indulgence. Freshly prepared, balanced and satisfying menu compositions keep you feeling good; wide vegetarian range. A clearly arranged assortment that places quality before quantity: Free choice of curries with various accompaniments. For all matters concerning open orders please call us: 212 44 77 rather than sending an email.